Zootopia is something of a combination of an analogy for our real world and the hopes and dreams of where we might one day end up-a utopia if you will. In Zootopia everything is indeed perfect and as animals have risen up to become responsible citizens of the planet it is of course, imagined. Still, this world is portrayed as a place where animals have evolved to the point there is no dividing line between the once vicious predators and the meek prey they once hunted, but rather both groups have moved beyond these primitive ways to conduct a society where everyone has the same opportunities and where all species get along with one another no problem. Of course, there are minor cracks of prejudice between certain sects of animals, but these seem to only be apparent in some of the more backward thinking individuals who still hold old traditions to be of an absolute truth. Sound familiar? Disney seems to be making no qualms about drawing the parallels between this imagined world where cute, animated creatures roam free and our own society where we too have trouble letting go of lessons drawn from a world of different circumstance and experience and not applying them to our current cultural landscape. That Zootopia is willing to display such faults is telling in the first place, but that it goes so far to make this desire to return to the old ways of thinking and ultimately existing by some tells even more. With a group of five writers and directors the film is primed to start many a discussions after viewing it as the film itself seems to have naturally come out of many a long conversations between its creators and their staff. If you're one who doesn't care to have your animated films relevant or culturally-charged rest assured the final product is still very much in the vein of what most parents and families will be expecting from the film, but with the added weight of such apt comparisons and broad resolutions of love and equality with acknowledged caveats to each situation there is certainly an added layer of meaning to the proceedings if you care to look. 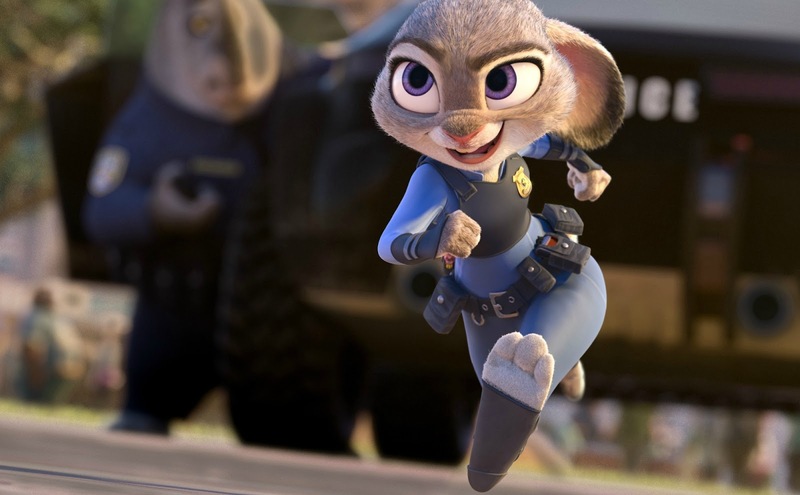 Officer Judy Hopps (Ginnifer Goodwin) is the first money to be made a police officer in the city of Zootopia. We begin with a brief history of how Zootopia came to be via a stage play put on by a few young, fuzzy mammals which inevitably introduces the audience to our unofficial mascot of the city and protagonist Judy Hopps (Ginnifer Goodwin). Judy is a bunny who dreams of making the already utopic Zootopia an even better place. Of course, the titular city can't exactly be a utopia in the traditional sense if there is need for a police force, but they at least uphold the city to as close to the given title as they can and Judy wants to carry on that tradition by becoming the first bunny cop. Her parents (Don Lake and Bonnie Hunt) aren't too sure of this life choice telling Judy that the beauty of complacency is that never having to try anything new means she'll never fail. This outlook simply doesn't line up with Judy's way of thinking though for despite there never having been another bunny cop Judy's only reaction is that she will then be the first one. If this all sounds rather juvenile it seems to be intentionally so if only to deceive unsuspecting audiences more when the underlying themes and main idea become more evident. We are ushered through Judy's training at the police academy and the knowledge that Zootopia is more or less the beacon of change for all the areas surrounding it including the small town where Judy hails from. We also learn that Zootopia is broken down into twelve unique ecosystems within its city limits including Tundratown, Sahara Square and the Rain Forest District to name a few. While Judy follows her dreams and indeed becomes the first bunny cop this is not the end of the challenges she must overcome as her arrival in Zootopia marks the entrance of an indifferent Chief (Idris Elba) who puts her on parking meter duty that only leads the inquisitive and proactive Judy to team up with a con artist fox named Nick Wilde (Jason Bateman) to uncover a city-wide conspiracy. While the added substance of the ideas and lessons the film is attempting to convey is certainly appreciated what I enjoyed most about the film was that I had no idea what it was about or where the story and plot would be taking me due to the fact the marketing only introduced audiences to this inviting, colorful world. 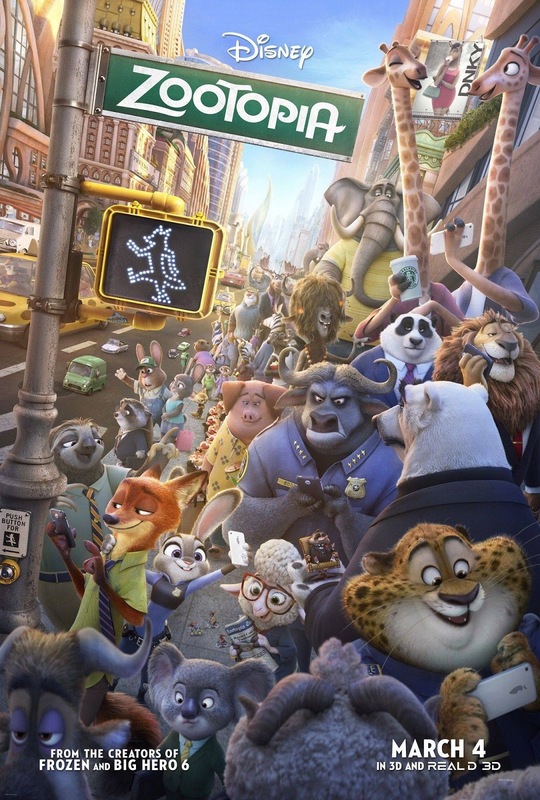 The surprise of seeing Judy navigate her way through the dynamics and politics of this fresh and fully realized environment is only the tip of the iceberg though, as it quickly becomes clear that we'll be getting to the core of what makes the city of Zootopia tick via a plot device that will not only add interest and intrigue to the obligatory adventure these characters must go on, but also preach its message of dignity without being...well, preachy. Through this conglomerate of ideas and near flawless execution I was enthralled from the get-go. 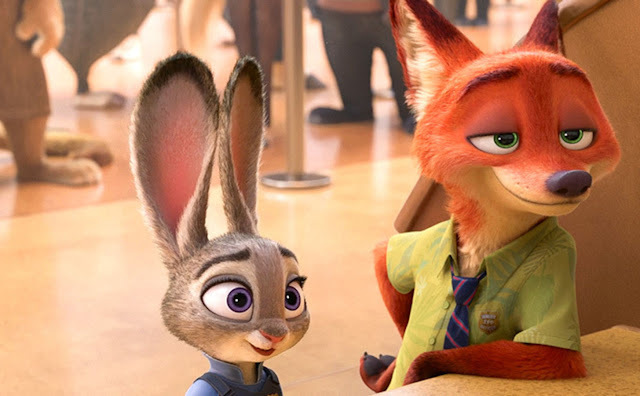 Goodwin makes a bubbly, reliable hero for whom you never doubt Judy's genuine nature while Bateman couldn't be a more perfect foil for which to spoil the grand, pristine picture of what an outsider like Judy expects Zootopia to be. As Wilde, Bateman's character design looks remarkably similar to Disney's 1973 version of Robin Hood (who was also a fox), but who rather than stealing from the rich to give to the poor is all about making money for himself and getting the most personal gain out of any situation he might find himself in. Through a series of fortunate or unfortunate events depending on whose perspective you view them from (Judy or Nick's) the two end up on the trail of a missing Otter who is part of a larger problem that has up to fourteen animals missing (all of which are predators) with no trace as to where they might have disappeared to. It is here the film finds its ability to really cast a spell though as it is in these moments, during Judy and Nick's investigation, that the film is allowed to show its high level of creativity, humor, and inherent ability to explore something complicated with little more than harmless-looking animals. Nick Wilde (Jason Bateman) advises Officer Hopps on the best way to run a license plate in Zootopia. Whether it be Jenny Slate's assistant mayor Bellweather, Tommy Chong's Yax who is of course a Yak, or even Flash (voice of Raymond Persi) the sloth prominently featured in the DMV trailer, there are moments of strong comedy and equally strong subtext throughout. Each of these are meant to elicit a type of caricature of sorts audience members might have come across at one point or another in our lives. While humorous their purpose in the bigger scope of Judy and Nick's objective is to provide color and flesh out the world we have come to inhabit while simultaneously being used as statements that deal in the bigotry towards different ethnicity's, homosexuals, those that have dealt with gender stereotypes, as well as not so hot topics like friendship and relationships not simply with a romantic partner, but within families and communities. Needless to say, Zootopia has a lot going on and it is able to contain these socially conscious themes and then convey them through nothing more than strong storytelling. If there's one thing that drew my attention away from the admirable message the film is touting it's that it ends up playing into stereotypes itself in certain instances. For example, in the opening moments where Judy is bullied by a fox whose parents ignorant views have clearly informed his level of intelligence said fox is blatantly made to resemble a backwoods Southerner who takes offense to any notion of change and fights back against anyone adamant for such variations on the traditional. While it is understandable why this character choice was made so as to get the films point across in a brisk fashion this still feels as if it's going against the films own progressive mentality. This becomes clearer when a stereotypical character voiced by Nate Torrence acknowledges as much about himself in an attempt by the movie to further illustrate how we shouldn't judge a book by its cover. This is a minor quibble in an otherwise laudable film that remains relentlessly entertaining, looks breathtaking on the big screen, and highlights why it is our differences that not only make us interesting, but beautiful.